For the second time this month, we visited a mansion which has now been turned into a museum. And, once again, it was the husband who provided the wealth made from the timber industry and the lady of the house who in large part spearheaded the art collection. On this occasion it was The Hyde Collection in Glens Falls, New York that was the object of our outing. 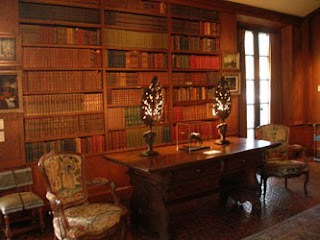 Located about forty-five minutes north of the Capital Region on the Hudson River, the home of Louis and Charlotte Hyde contains family furniture and works of art by such famous painters as Rembrandt, Rubens, Botticelli, Renoir, Picasso, Winslow Homer, and many others. The Italian Renaissance style residence is small by twenty-first-century standards but is built around a lovely two-story courtyard. We figure that the view onto a monstrous extension of the paper mill was nowhere in sight when the couple occupied the building from 1912 until 1963. Among the paintings hanging in the house, I particularly admired Willard Metcalf’s Blossoming Maple which seems to capture the bright leaves and buds of early spring. 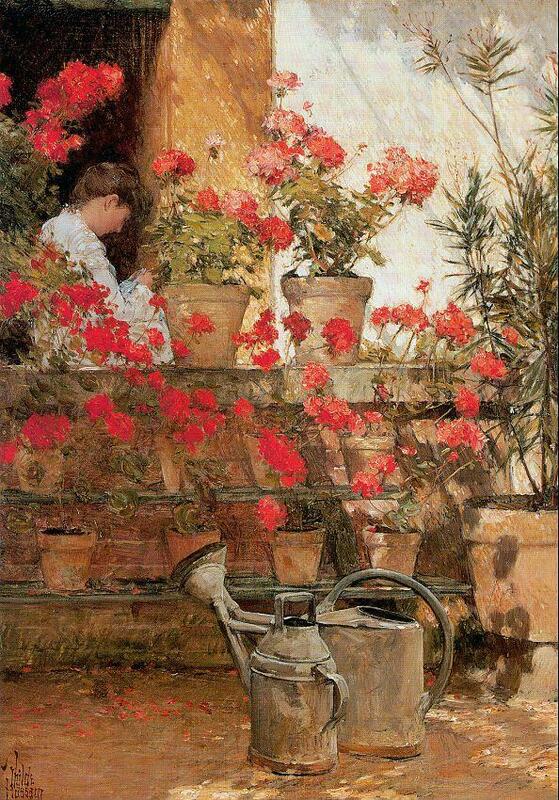 Another work, this one by American impressionist Childe Hassam, shows a cascade of red geraniums in a summer garden. Afterwards we took a guided tour of Objects of Wonder and Delight in the museum's exhibition hall. The touring show, produced from works in the Norton Museum of West Palm Beach, Florida, contains mainly paintings but also photographs, a doll house, and, of all things, a felt suit. Our guide, Pat, did a nice job of describing the works of art and engaging the group in the discussion as well. She began the tour by telling us that royal art academies in Europe set rules for artists, including a hierarchy of preferred themes. At the top of the list were Biblical subjects, followed by mythological, then political/historical topics, portraits, landscapes, animals, plants, and still lifes. The only subject matter considered lower than the still life was in the area of man-made objects. 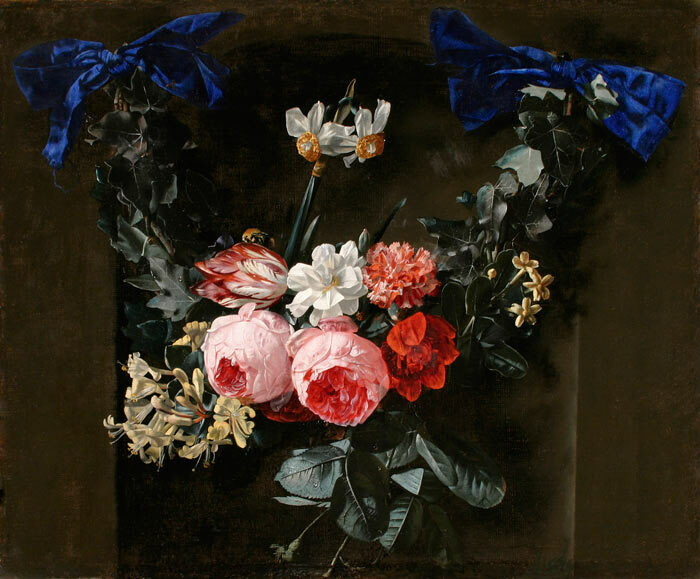 That being said, the still life has been in existence since the time of ancient Egyptian funerary paintings and really became popular in Dutch painting of the seventeenth century. The fifty plus works in this exhibit are devoted to four centuries of still life in art. 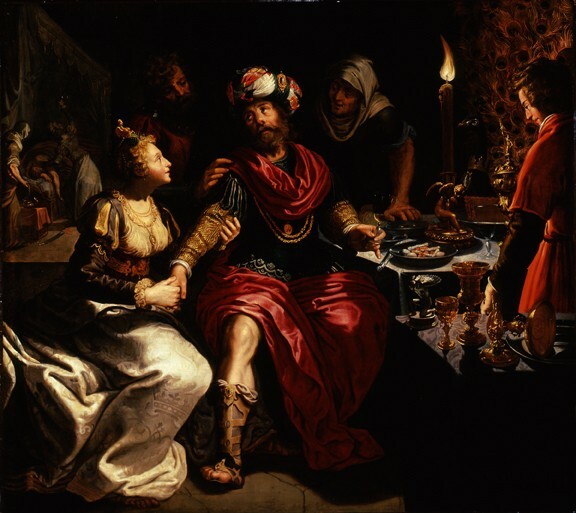 Pat’s first choice was to look at Banquet of Holofernes by Dutch artist Kaspar (or Gaspar) van den Hoecke. This complex painting portrays the Biblical tale of Judith who, in order to dispose of Holofernes, an invading general, plies him with food and drink and then beheads him. There is a wide array of typical still life items such as glassware and food on the painting’s right which are bathed in candlelight. On the left our guide pointed out a rectangle containing action from another time period when Judith later slips into Holofernes’s room with a sword. The intricate and beautiful style displays the skill of the artist and supports the complexities of the story. 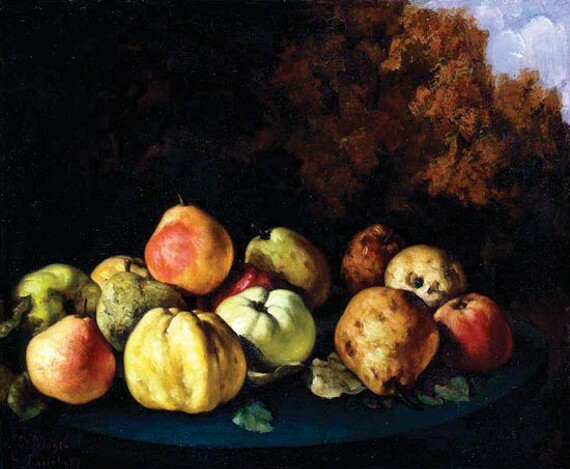 Next, the group discussed three works dealing with fruit in very different ways. The first by nineteenth century Frenchman Gustave Courbet accurately portrayed a tray full of fruit. Then there was a joyous, if not realistic, 1924 Walt Kuhn painting of Dancing Pears. Rounding out the trio was Canadian Edward Manigault’s Still Life with Pears, Bananas, and Grapes (1918). The lush coloring of this exotic work serves to celebrate life and to remind us to reflect on where our food comes from. It was a very enjoyable way to spend the afternoon.